There are two strains in the tradition of the mystery story. They exist in tension but aren’t necessarily incompatible. One is the “puzzle” story, where the characters exist mostly as vehicles for the central problem. This kind of story has characteristics of a game. The storyteller sets all the clues fairly before the reader, and the reader attempts to solve the mystery before the detective character does. The second strain is the character-driven story, where the reader’s pleasure comes from discerning the hidden motivations behind the masks the suspects present to the world. The character-driven story is typically a psychological drama. I think that for most mystery fans (certainly for me) the best mysteries contain elements of both strains. Stories that compel me to study railway timetables lose my interest fairly quickly, but a mystery shouldn’t become a soap opera, either. (This, in my view, is where the English TV series Sherlock, which began marvelously, lost its way last season.) 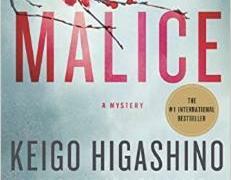 Bestselling Japanese author Keigo Higashino has found a very good balance in his novel Malice, translated into English by Alexander O. Smith. Police Detective Kyochiro Kaga is called to the scene of the murder of successful mystery writer Kunihiko Hidaka, killed in a locked room in his home. The chief suspects are Hidaka’s wife and his childhood friend, children’s author Osamu Nonoguchi, who by coincidence is also an old acquaintance of the detective. Kaga is a smart, methodical investigator, and he soon explodes Nonoguchi’s alibi. But that’s only the beginning of the story. Confronted with the evidence, Nonoguchi confesses almost cheerfully to the murder. He and Hidaka were not actually friends, he explains. Hidaka held an old secret over his head, and was forcing him to write his novels for him. Nonoguchi was no longer willing to live without the credit he was due for his work. Also, he had been in love with Hidaka’s first wife, whose death Nonoguchi blamed on him. That seems straightforward enough, but Detective Kaga is unsatisfied. The confession has minor holes, ones that nag at him. Gradually, as one peels away the layers of an onion, he works his way down to Nonoguchi’s true, secret motive. Point of view jumps from character to character, a technique which is neatly both enlightening and misleading. The process of investigation is engaging, and the prose in translation (I think) good. Speaking as one with small familiarity with Japanese culture, the flavor of the text seemed to me very appropriate for the setting. The language is spare and precise, almost dry, contrasting effectively with the passions concealed under the surface (though there was one point where I lost track of who was saying what in a long stretch of dialogue without attributions). Malice is a rewarding novel for the reader interested in non-western cultures, and for especially for readers fascinated by human psychology and motivation. Recommended. Lars Walker is the author of several fantasy novels, the latest of which is Death’s Doors. Sounds rather promising, thank you. I will look it up.